Dioxide Pacific are experts in the design, manufacture and installation of chemical dosing systems and chemical storage facilities. Typical applications include storage and dosing of Alum, fluorosilicic acid, PACl, flocculant, polyelectrolyte, potassium permanganate. The list is limitless. Whatever your chemical, we can provide a system for safe storage and accurate dosing. We can provide standard chemical dosing packages or bespoke (customized) packages to suit your requirements. Our standard chemical dosing packages are specified by an ident code. Please refer to our chemical dosing systems brochure to view the ident code options . You can also select the ident code using our web form. Click on the button at the top of this page. For detail on fluoride dosing systems, please visit our fluoride page. Dioxide Pacific designed and installed a pH correction system for a semiconductor production plant. This facility uses HF, other inorganic acids and bases in the production system which are washed with RO water to waste. Raw waste is collected in a sump 4m below ground level and pumped to three x 3 kL treatment tanks in series. pH is controlled in each tank with PID controlled addition of sulphuric acid and sodium hydroxide via ProMinent Sigma dosing pumps. If the pH is not correct in the final tank, it is automatically recirculated back to the first tank for re-processing. The plant is controlled via a central PLC and HMI operated control panel which logs data, sends email alarms and has remote internet access via a 4G router. 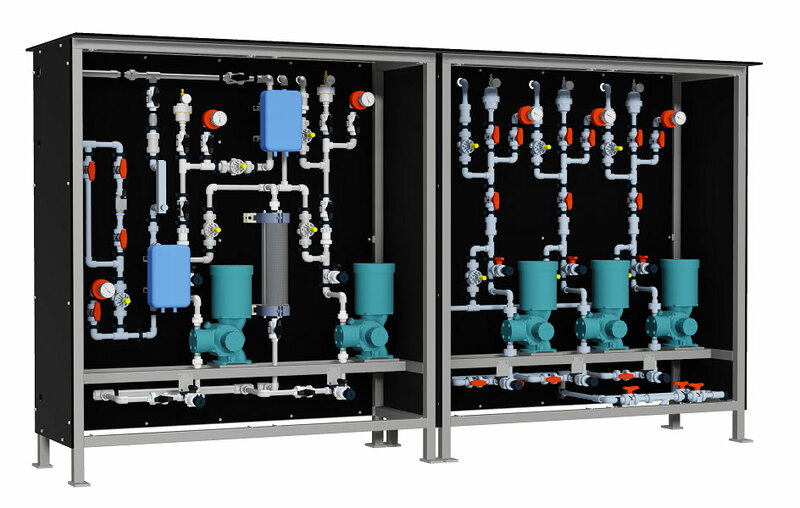 If you have a waste water system which requires pH correction or disinfection, Dioxide Pacific can design and install the system and guarantee the outcome. Contact us today. Dioxide Pacific was engaged by a power station to design, supply and install a chemical dosing system for PACL and polymer. Ash water is pumped from a nearby dam and dosed with PACL (poly aluminium chloride) to aid coagulation before this water is introduced into a clarifier. The system consists of a 2 x stainless steel 1,000L IBC bund tanks, ProMinent Sigma S3Ca chemical dosing (metering) pump, by-pass pipework and pump, ash water pipework and electrical control panel. Ash water is pumped from the dam into 200mm schedule 80 grey UPVC pipework. This pipework is located on concrete bases near the chemical dosing plant. Water is drawn from the ash water pipeline, dosed with PACL and then mixed back in just prior to a static mixer. Liquid polyelectrolyte is diluted in-line prior to introduction into the PACL dosed water. The treated ash water is introduced at the clarifier inlet. The complete chemical dosing system is controlled from a local control panel with Allen Bradley PLC and monitored from the plant SCADA. Dioxide Pacific was responsible for concept and detailed design along with installation, commissioning and proving of plant performance. Dioxide Pacific was engaged by a water authority to design, manufacture and install a chemical dosing system for pH correction of runoff water from chemical storage areas. The system consists of chemical dosing pumps for sulphuric acid and caustic soda, 12000L fibreglass underground treatment tank, recirculation and discharge pump, chemical dosing and transfer pipework and IBC Bunds for chemical storage. Control of the chemical dosing pumps is from a ProMinent D1CAW0P bi-directional pH controller which provides pulse output to both dosing pumps. Once the pH is correct and the level in the tank is at high, treated water is discharged to sewer. The complete chemical metering system is controlled from a local control panel with Allen Bradley PLC and monitored from the plant SCADA. Dioxide Pacific was responsible for concept and detailed design along with installation and commissioning. Dioxide Pacific was engaged bv Coliban Water in Victoria to design and construct a chemical dosing and storage upgrade for alum at the Echuca Water Treatment Plant. The installation included removal of existing storage facilities which did not comply with EPA bunding guidelines and replacement with new 38,000L bulk storage tank, concrete bund and tanker unloading facility. New chemical dosing pumps ProMinent Sigma S3Ca were installed with flow paced 4-20mA control from site SCADA. Dosing pumps were installed inside a 316 s/s cabinet to protect them from the weather and vandalism. The bund area was fully enclosed with a safety fence. Dioxide Pacific was responsible for full mechanical, electrical and civil works for the project and final performance testing. For more information on chemical dosing systems or to obtain a quotation, please complete the feedback form on our Contact page.